Does anyone else feel like the last amen at conference is like saying goodbye to a dear friend? Sigh. So to help us through our withdrawal, let’s reflect on what conference meant to us. I’m sorry it took me a while to get this up today, but here are eleven questions that you can answer on your own blog. Then come back here and post the link for us. (Please share the link that goes directly to the meme post, not just your blog.) I’m trying out that fancy linky thing at the bottom of this post, but if it doesn’t work, then linking up in the comments works just fine too. I will come and visit every single one. I’m excited to hear what you learned. Thanks to Lesa for helping me both write and host the meme. The questions below have my own answers, so if you want a cleaner version to cut-and-paste on your blog, you can get it here. Even though it was for fathers, I loved Sister Dalton’s talk. It made me grateful for my father and my husband, and taught me a lot about being a better mother too. 3. What was your favorite Hymn and why did it move you? When the choir sang “Consider the lilies” I really felt the message. It seemed a perfect fit with Pres. Uctdorf’s conference and RS talks. President Uctdorf had a kickin’ purple striped tie on Saturday morning. 5. Were there any topics that you felt like were repeated often? Any conference “themes”? Were there like 10 talks about reading scriptures? Because it sure felt like it to me. Such a great reminder I needed. 6. Share a few of your favorite quotes from any of the talks (paraphrasing is fine). Loved Elder Andersen’s reaffirmation of the importance of the family. Loved Pres. Monson’s declaration that we are unapologetically different from the morals of the world. Also really liked when Pres. Eyring quoted Marion G. Romney (I think) about true conversion means that your desire to do anything contrary to the gospel is dead. 7. Name something(s) that made you smile or laugh during conference. 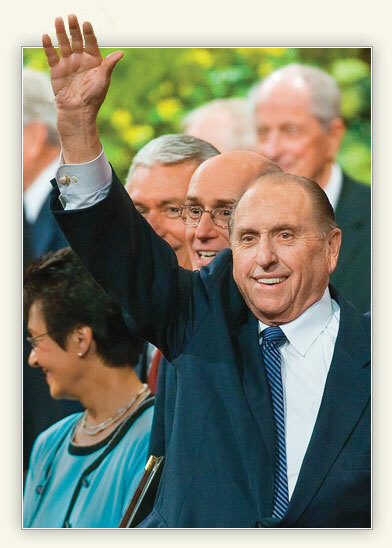 President Monson’s cute faces and humor. The 29-cent chicken story. Pres. Eyring remembering what happened to Abinadi when he testified of Christ against his audience’s will. 8. Was there any evidence that your children paid attention? Oh gosh, they did so great. Really. Tonight my 4-year-old Natalie said to me in the kitchen while we were setting the table, “I’m going to miss General Conference.” Me too, Natalie, me too. 9. What doctrine did you learn as you listened to the choir(s) sing? 10. Did the music enhance your General Conference experience? How? Yes, of course. I love the parts where me and the kids get to sing along. 11. What are some of your post-conference goals? Oh heavens, so many. Foremost, I will adapt a no-excuses policy when it comes to reading scriptures. I want to pray more fervently and sincerely. I want to teach my children about family history. I want to be more careful and more purposeful in all my online time. So many things I want to work on, not out of guilt, but out of true desire to serve the Lord and receive his blessings. Also, week 1 of General Conference Book Club is up and running too, so don’t miss it. Click here to enter your link and/or view all the participants. Thank you Stephanie for giving me opportunity to join you in this meme and trivia questions. To your readers if you click on the word ‘click here’ you can see all the thumbnails that have been submitted on the linky-code. They are the same as the ones on my link list. Thank you for sharing your meme’s. I, too, will be looking at every one of them. Thank you!! Thanks for the meme ladies! Yes, conference was wonderful. I love being able to notice themes when I listen to all the sessions. It is amazing how things work together when each speaker prepares without an assigned topic. Thanks for hosting! I love your daughter’s quote about missing conference! Too cute! I love to listen to General Conference! Love President Monson’s humor. Loved how he addressed everyone Saturday by saying “hello”. Loved hearing all the Primary songs too. I love feeling the spirit at conference. Makes you feel so good!! Loved, loved, loved conference this time around. I don’t know why it was better than ever, but it really was. I will have to put this one up on my blog tomorrow. Thanks for the wonderful reminders. This was so fun, Stephanie. Thanks. Loved Elder Ardern’s admonition to find better uses for our time than “catapulting angry birds at concrete walls”! Went to High School (CCNZ) with him & am pretty sure he would have been ok with that activity-WITHOUT the aid of technology (smile). He’s grown up rather nicely, don’t you think? I also quoted Pres. Monson’s “look up” advice on my son’s memorial blog, togeorgeonleaving.blogspot.com. Don’t know if it’s too personal for your readers, but I’m happy to share my grieving journey experience if you have a place for it.